Emergency room doctors and police across the country say they are seeing a new surge of overdoses and crime related to drugs known as “synthetic marijuana.” Federal investigators say the drugs have little to do with marijuana and are often made with a variety of unusual chemicals produced in China. 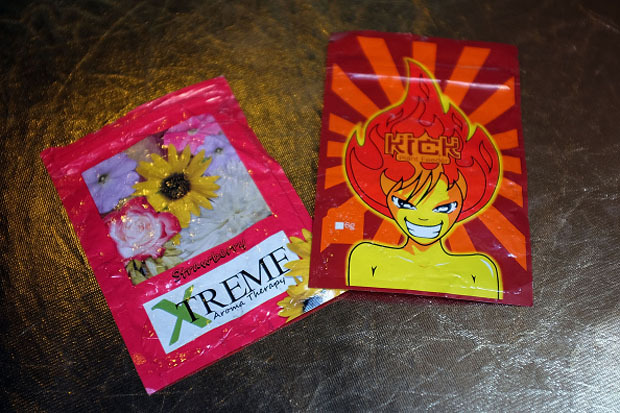 The drugs, also known as synthetic cannabinoids, are sold in slickly marketed packets that look like candy; with names like Spice and Scooby Snax, they’re sold online and in convenience stores. We look at what’s behind the increase in the use of synthetic marijuana and efforts to educate the public. MS. DIANE REHMThanks for joining us. I'm Diane Rehm. The synthetic marijuana that's becoming a public health and safety problem has little in common with marijuana. Unlike real marijuana, these new drugs can result in extremely violent behavior and serious heart problems. Doctors and police say the drugs often make people so psychotic, they have to be held down by four or more people. Here with me to talk about synthetic marijuana, Marilyn Huestis with the National Institute on Drug Abuse, Erin Artigiani of the Center for Substance Abuse Research. MS. DIANE REHMJoining us from a studio in Toronto, Dr. Gabe Kelen with Johns Hopkins University Hospital. But first, before we begin our panel discussion, we're joined by the acting administrator of the Drug Enforcement Administration, Chuck Rosenberg. He says synthetic marijuana is a large and growing national public health threat. Thanks for joining us, sir, and would you give us a sense of just how dangerous these drugs are and what can you tell us about the surge in use around the country. MR. CHUCK ROSENBERGWell, Diane, first, thanks for having me on your show. ROSENBERGIt's a great, great honor. ROSENBERGThank you. Well, I think you've hit it in your opening. These are extraordinarily dangerous drugs and, I should point out, calling them synthetic marijuana is a bit of a misnomer. They really have very little in common with marijuana. We're seeing it pop up all around the country. The thing that is so dangerous about it, that it's completely unregulated, unlicensed. The dosage amounts vary. The chemicals vary. ROSENBERGYou and I could buy and use the same packet of synthetic cannabinoid, can have vastly different reactions to it. And what's so crass and what's so vile about this is that it's being marketed specifically to kids. REHMDescribe what these drugs actually are. ROSENBERGWell, they're many different things. In fact, our scientists have identified roughly 100 different types of synthetic cannabinoid in the last four or five years so in some ways, chemically, they're made to mimic THC, the active ingredient that you find in marijuana. But the effects on the body are very unlike marijuana and, as I said, can vary dramatically from person to person. I am particularly disturbed, as I said, by the way it's marketed. ROSENBERGSo you can buy this stuff in convenience stores, in gas stations. You'll find them in shiny, foil packages with cartoon characters on the front so the target audience is very clear. REHMSo I gather people have no idea that these little packets are actually sprayed with all kinds of mind-altering chemicals. ROSENBERGWell, that's exactly right. So there's a leaf substance in these packages, which are -- tend to be legal. There are sort of two main types and it's not worth going into details about those. It's the stuff that's sprayed on them that you're referring to that is so dangerous and so lethal. We know most of it, 95 percent of it, comes from China. It's very easy to order over the internet. And what happens with, believe it or not, maybe a $1500 investment in a kilogram of the chemical is that you can turn this into a $250,000 profit on the street. REHMSo that one of the main challenges, I gather, is that once one of the harmful chemicals are deemed illegal, then the whole formula changes. ROSENBERGWell, that's right. And these mad scientists, for lack of a better word, are constantly tweaking the formula so one is -- if one is deemed illegal, they can switch a molecule or two and sort of repackage the product, sell it anew. It comes into this country. It's sprayed with a solvent onto a leaf type product, repackaged and resold. And so we see it cropping up from one city to the next, but almost always in a different form and inevitably with different reactions by the users. REHMSo how are police departments dealing with this? ROSENBERGWell, often reactively and by that, I mean, it's sometimes hard to know and to predict where it will turn up. It's almost like we have hot spots or flares around the country and suddenly it will become popular or big in one particular city and some kids will overdose and first responders and emergency rooms will see a huge uptick and then just as quickly, it's gone and it's somewhere else. REHMSo I gather that the Drug Enforcement Agency is helping law enforcement test the drugs. ROSENBERGWe do. So we do a lot of the testing. We have chemists and forensic scientists around the country. Some of the testing is done at local labs. Much of the testing is done at our labs. We try and identify the substances, but as I've mentioned, we've seen probably more than 100 over the last four or five years and we are trying very hard, sometimes successfully, sometimes not, to stay ahead of the folks who are manufacturing this poison. ROSENBERGYou know, as I mentioned, so much of it comes from China and that's a difficult environment for us to operate in. We've had some luck at working with Chinese officials, but many of these chemicals are lawful in China and so there's little, in some cases, that Chinese officials can do to help us. REHMSeems to me it's pretty scary because these drugs are being marketed to teens and pretty easy to buy. ROSENBERGVery easy to buy. Very simple to find, whether in a convenience store or on the internet. You know, I know that the kids I worry about the most probably don't listen to your program, but I know that their parents and their counselors and their teachers and their coaches probably do so I appreciate the fact that you're doing this. We are trying to get the word out, but this is a tough target audience to reach and to tell them what sort of danger they're in. REHMI want you to talk about some of the names that these drugs go by. ROSENBERGYeah. There's a whole bunch of different names and they change all the time. Sometimes it's Spice, sometimes K2. They've been called Scooby snacks, Dr. Feelgood, Orange Crush, Joker, Pure Sin, Black Widow, High Life. There's a whole bunch of names, but the names and the packaging, frankly, Diane, change just as quickly as the chemical composition of this poison. REHMAnd how are they labeled? Do I understand correctly that they are labeled "not for human consumption"? ROSENBERGOften, the packaging will say, "not for human consumption," which is, in my view, just sort of a crass and vile attempt to skirt, you know, U.S. law. In fact, that's exactly what it's intended for and that's exactly why people are buying it, for human consumption. REHMNow, I know that the DEA has taken down several synthetic marijuana drug networks. Tell us about Project Synergy. ROSENBERGSure. Well, Project Synergy started in 2013. We had a huge takedown that year, another huge takedown in 2014 and I know you'll appreciate that I'm not at liberty to divulge our operational plans, but more to come on Synergy. But you should know that since January of this year, January of 2015, we've seized more than 2,000 kilograms of synthetic cannabinoids, Including seizures in Phoenix and Chicago and New Orleans and New York, Houston and New Jersey and we've also seized some of the underlying leaf medium that I was discussing. ROSENBERGWe seized 1.2 tons of damiana leaves in April of this year in Phoenix. That's the stuff that they spray the solvent onto. So it is everywhere and it's all the time and it concerns me immensely. REHMAnd it's all across the country, we should say. I gather you've arrested some 150 individuals and taken in something like $20 million in cash and assets. ROSENBERGThat's right and sometimes I worry that that's just the tip of the iceberg. As I've said over and over again, and I really need help in getting this message out, taking this stuff is like playing in four lanes of oncoming traffic. You might make it a few yards, but eventually, you're going to get flattened. REHMChuck Rosenberg, he is the acting administrator of the Drug Enforcement Administration. Good luck to you, sir, and thanks for joining us. ROSENBERGThank you for having me, Diane. REHMShort break here and when we come back, we'll talk more about these drugs, how they're being marketed, who's taking them and what you should know. Stay with us. REHMAnd welcome back. We're talking about something that's being called synthetic marijuana. In fact, it is not marijuana at all, but a combination of very powerful and sometimes legal -- sometimes lethal drugs being sold over-the-counter and on the Internet. You've just heard the acting administrator of the Drug Enforcement Administration. Now we'll turn to our guests both here in the studio and in Canada. Marilyn Huestis, she's at the National Institutes of Health. Erin Artigiani is deputy director at the Center for Substance Abuse Research at the University of Maryland. And from a CBC Studio in Toronto, Canada, Dr. Gabe Kelen, he's an emergency physician in chief at Johns Hopkins University Hospital. REHMAnd, Dr. Kelen, let me start with you because I know you've witnessed something of a surge of people coming into the ER on these drugs. Tell me about them. How do they behave? DR. GABE KELENSure. Thank you very much, Diane. KELENI appreciate being on the show. Just to pick up on where Chuck Rosenberg left off, to give you an appreciation of what we're seeing. The drug trade is a very big business and it's run like corporations, with officers and distribution networks, sometimes competition at the local level from artisans. And they're all jockeying for space. And they compete on product. And so as much as they can distinguish their product or make it more attractive or introduce it to a new audience, that's what they're fundamentally trying to do. And some of the adulterants that are in this synthetic cannabinoids menetics, they affect the -- the reason they're called related to marijuana is that they affect the THC receptors, the same receptors that marijuana does. KELENHowever, some of these substances -- and I think some of your other guests will speak to this -- have affinity for these receptors 2 to 100 times, with very powerful and unpredictable effects. So we see four fairly dramatic presentations. The first, I'll call adrenergic. Your body is essentially completely on the go, all systems firing. Your blood pressure is sky high. Your heart is racing. You're agitated. You're vomiting. You're confused. It feels like the utmost panic attack and may result in things like seizure, stroke and even heart attacks. KELENAnd this has affected children. And there's been some studies to show that even children can damage their hearts from this. There are different ways to take it. Most people smoke it and there's some carbon monoxide effect from the smoking, which decreases the ability to take in oxygen and to the red cells it competes for it, further impairing the heart to deal with this. Along the lines of this adrenergic surge that -- as I call it -- is a term that's been coined called "Spiceophrenia" or pot psychosis. These people are very paranoid. They can turn on a dime. And they're extremely agitated. KELENWhen you get the agitated form, one of the last patients that we had required eight fairly burly police officers to try and wrestle them down so that the EMS folks could administer a medication that could help calm them down so the rest of us could take care of the patient. So those are two very dramatic bodies going in full tilt. The other thing that we see is -- there's another system that opposes this adrenergic system, called parasympathetic and it has the exact opposite. And there are two schools of thought. One is that, in high doses, the parasympathetic system predominates and your blood pressure bottoms out and your heart rate bottoms out to very low levels. KELEN...with other type of medical conditions. And then, I think at the beginning of your show, you talked about the violence associated with the drug trade. And in the Baltimore area very recently, violence for various reasons has increased. And it may or may not be directly related to the Spice surge. KELENBut we're seeing way more, very severe bodily violence related to the drug trade. So maybe I'll stop there for the moment. REHMDr. Gabe Kelen. He's an emergency physician at Johns Hopkins University Hospital. And turning to you, Marilyn Huestis, I gather one of the scariest things about these synthetic cannabinoids is everything that's unknown about the kind of drugs that are being sprayed on top. MS. MARILYN HUESTISYes, Diane, that's very true. We are really concerned with all of the production of these compounds in laboratories that have been shown to be absolutely filthy, with no quality control. So you have lots of other chemicals, side products that are very toxic. And there's no control over that. So we have wanted -- we study, at the National Institute on Drug Abuse, we study all about the effects of drugs so that we can educate the public about the health and safety hazards of these drugs, about learning about addiction and learning about withdrawal, that was just brought up in our last speaker. MS. MARILYN HUESTISAnd so when someone takes these drugs, they have no idea what they're taking, the potency of it, what other toxic chemicals might be present and how they're going to react to it. So one of the biggest problems for us -- we study drugs so that we learn all this -- and we have not yet, even though I've been trying since 2008, we haven't been able to study these synthetic cannabinoids. And the reason is, even though I have doctors and nurses and crash carts and all the things you would need, we can't do it because we don't know enough about both the acute toxicity and the long-term toxicity. HUESTISAnd so here you have so many young people taking these drugs with no support and no idea what they're going to be exposed to. REHMAnd turning to you, Erin Artigiani, who is taking these drugs? Are they college students? Are they high school kids? Who has access to them? MS. ERIN ARTIGIANIWell, we have been monitoring trends for synthetic cannabinoids as a part of a project that we have that's supported by NITA called the National Drug Early Warning System. And as a part of that, we monitor things like you're asking about today: Who is it? Who's using these drugs? And so one of the things that we've seen over the past few years is that synthetic cannabinoids were first found in the United States at around 2008 in a seizure in Ohio and then peaked in around 2011 or 2012 and came down slightly. But now, this year, it seems like something's changing, something's different. MS. ERIN ARTIGIANIAnd so, for instance, there's been a surge in human-exposure calls that's been reported on regularly over the past few months by the American Association of Poison Control Centers. And this year, already, in the first seven, seven-and-a-half months, there have been more than 5,200 calls to poison centers across the country. REHMAnd these are across the country. REHMAnd how do the poison control centers react when they get those calls? ARTIGIANIWell, they have a standard protocol that they would use for any call, where they get as much information as they can from the person about who they are and what they're experiencing and what's going on so they can advise them about whether they need to be referred to 911 or seek medical help or take some other kind of action. REHMBecause if you normally call a poison control center, you would say, you know, something like, "My child just swallowed a particular substance." But if they don't know what these substances are, how can the poison control centers refer them? REHMHow do we know or do we know that all these drugs are coming from China? Can we trace them, Marilyn? HUESTISSo the DEA has intelligence sources and they have found these -- that primarily it's China. But it's also from India and other locations. It's -- if you have good chemists, you can make the drugs. But I wanted to add something about the kinds of people that Erin was talking with. There's really two kinds. One is any kind of young person who's interested in experimenting and trying a new substance. But the other is anyone subject to drug testing, so police, firemen, athletes. I'm on the World Anti-Doping Agency Prohibited Drug List Committee and we prohibited these drugs in 2010. HUESTISBut anyone who's subject to this kind of testing, anyone in a criminal justice situation or drug court, they know they will probably not be picked up for these drugs. HUESTISBecause it doesn't react with the normal tests that we do for marijuana. REHMIt sounds as though you're going to have to expand the kinds of testing that you do. HUESTIS...so we can educate the public. REHMDr. Kelen, how often are these people who come to the emergency room able to identify what it is that's affecting them? KELENMore and more, either they or a family or friend knows now to tell us. In the earlier days, around 2011 or '12, it wasn't that clear what was causing this. And neither the patient nor we fully understood it. But today, people are amazingly upfront and you'll have parents come in and say, "My child took 'X' and 'X', Scoobies or whatnot," and so we do have some forewarning. However, given that the presentations are dramatic and acute, we really do not have time to rely on any kind of drug testing to figure out what's going on. We have to react to the situation in front of us and distinguish reactions to Spice from other medical conditions that might be just as real but not related to the drug that they took. Or they may be taking other substances simultaneously. REHMI see. And you're listening to "The Diane Rehm Show." Well, Dr. Kelen, given that kind of lack of knowledge, how do you treat people when they come to the ER and they are in these states that you described -- either with extremely violent reaction or rapid heart rate, on the verge of heart attack. How do you treat them? KELENThe approach is fairly intense but straightforward, as some of the conditions that mimic these things are treated similarly. So we go down the diagnostic path to make sure we're not missing anything. But most of these patients, the ones that are firing on all cylinders, for example, we will sedate them with various benzodiazepines, give them lots of fluid. If they're vomiting, we'll give them anti-nausea medications. The ones that are very violent, we will give them antipsychotics to cool them off and calm them down. KELEN...simultaneously taking care of this one patient. REHMYeah. Now, Marilyn, am I correct that some homicides and some suicides have actually been attributed to use of these drugs? HUESTISYes, absolutely. And there's been issues with self harm, where individuals will harm themselves under the influence of these drugs. And they actually have this psychosis that Dr. Kelen was talking about. And what I think is important, Dr. Kelen said, well they don't have time to figure out what drug they've taken. But after the fact, it's critical that we find out what drugs they're taking. So for instance, we had a whole rash of kidney failures. And you know which specific -- so the family and the person might say they were taking synthetic marijuana or Spice -- but we need to know which compounds are producing the kidney failures, the heart attacks. REHMTell me once again, Erin -- I want to be clear about this -- if someone in a grocery store or in a truck stop is selling these substances, are they on the counter, are they behind the counter? What happens? ARTIGIANII think it varies at this point in time because there's been a lot of effort by law enforcement and local community associations to address the stores where these substances are being sold. And so, for instance, D.C. recently just this past month passed a new law that would enable them to close a store for up to four days and impose a fine of $10,000 for a first offense, if the store is found to be selling something that resembles or is a synthetic cannabinoid. So sometimes they might be out, sometimes they might be behind the counter and you might have to know the code word for them to bring it out to sell it, that kind of thing. But it can vary. And sometimes they are sold out on the street or on the Internet, as Marilyn Huestis mentioned earlier. REHMOn the Internet. Wow. All right. Short break here and, when we come back, time to open the phones, read your email. There's lots of that on this issue of synthetic marijuana, which is a total misnomer. And we'll get to that when we come back. REHMWelcome back. We're talking, in this hour, about the growing use of synthetic drugs. It's been called synthetic marijuana, but that's a total misnomer, is it not, Marilyn? HUESTIS...to the same receptors in the brain. REHMBut trying to text and find out which drug you're dealing with has got to be impossible. HUESTISIt's like taking a puzzle, 1500 piece puzzle, throwing it up in the air, and no picture to put it back together. But that's what we're trying to do. We're taking live human cells and we're feeding these drugs to them and being able then to, with high resolution mass spectrometry, tell you what the drug is. They're constantly coming on the market, as quickly as the DEA schedules one, I mean, immediately, new things are advertised within hours. REHMAll right, let's open the phones. Go to Donna here in Washington, D.C. You're on the air. DONNAHi. My parents were killed by a young man high on synthetic drugs in June of 2012. They were coming home from the grocery store and he was in his -- the man high on synthetic drugs was in a truck, and just totaled their car. REHMOh, Donna. I'm so sorry. DONNAYeah, so my point is we should not be looking at these people as isolated people high on synthetic drugs and not being dangerous. They are dangerous to others. So that's my point. This slight instinct that they have as a result of synthetic drugs means that they're going to be violent and they're going to run and they have no judgment. REHMAll right. Thanks for your call. And again, my sympathies. Dr. Kelen, do you want to comment? KELENWell, the caller raises an excellent point, that there are all these people with collateral effects when you use drugs, and it's not limited specifically to spice, alcohol, cocaine and any of the other things that are marketed. Will impair judgment, and people will be driving, just like with alcohol, and do some very, very silly things. And they have no judgment and no ability to control themselves as if they were sober. And so, we see these people. Now, when they come in, we are not aware that whoever caused the kind of trauma that they had through car accidents and whatnot that they were victims of someone high on drugs. REHMHere's a tweet from Vera, pointing to an issue you raised earlier, Marilyn. She says, people turn to synthetic marijuana, assuming it's benign, to avoid testing positive for drugs at work. HUESTISThat's absolutely true. They have a very high chance of not being detected because the tests are expensive and difficult to do. And frankly, hard to keep up with this constant new drugs available. REHMAnd an email from Thomas, who says I often hear the claim these drugs come from China. How do they know that these drugs originate from underground Chinese chemists? Erin. ARTIGIANIWell, I can't really speak for the DEA, but I know that they do have an intelligence network, as does law enforcement, does a part of, for instance, the high intensity drug trafficking areas where they are regularly exchanging information and tracking where, and mapping, where drugs and chemicals are coming from. REHMIs that where the assumptions lie? HUESTISYes, and they've certainly intercepted these through customs, through the US Postal Service and other areas. Where they've been able to track back. And unfortunately, the Chinese government is not cracking down on this production. It's a major industry there. REHMAnd to what extent is the DEA trying to get China to crack down on these? HUESTISSo again, I couldn't speak to that. I think we'd have to ask the DEA, but I know that they take this very seriously. They have a major task force working as he spoke about Project Synergy. And I'm sure that they have multiple initiatives. REHMAll right, and to Robert in Peoria, Illinois. Go right ahead, sir. ROBERTThank you for taking my call, Diane. ROBERTAs reported in today's Wall Street Journal, there was a -- there is a new synthetic drug called Flakka. F-L-A-K-K-A. Which simulates crack cocaine. Flakka is not a cannabinoid. It is especially dangerous and induces hallucinations, delusions and hyperthermia. It is very cheap. It only costs five dollars a dose, which makes it especially attractive to the drug using community. And it has largely supplanted cocaine in some areas of the country. I suspect it's only a matter of time before it causes hypertensive crises and heart attacks. ROBERTTo me, synthetic cocaine would seem a lot more dangerous than cannabinoids. Why can't the FDA and the DEA regulate these drugs? They regulate all other drugs from aspirin to opiates. REHMDo you want to comment, Erin? ARTIGIANII think you raise a very important point, and certainly, Flakka is a substance that we are monitoring. We've heard about it quite a lot from our colleagues down in Florida, in particular. And as you pointed out, Flakka is also another kind of synthetic drug. It's a synthetic stimulant or cathinone. And it can be different kinds of chemicals as well. We have the same situation with these drugs as we have with the synthetic cannabinoids where they change regularly to skirt the law. And so the effects can change as well. REHMOur caller raised the point about price. Are all of these synthetic drugs cheaper? HUESTISThey're very cheap, and as the DEA acting administrator said, there is a huge profit margin. And they don't have to worry as much about the smuggling and the distribution systems. They're doing it through the internet and things. So, the costs are very low, which make them easy for young people to be able to afford. REHMOkay. So, here's my concern. Here we are talking about all this. How cheap it is, how easy it is to get hold of. Are we, by talking about it, promoting its use? HUESTISI hope we're not. I hope that what we're doing is educating the public as to the very serious health effects. We know people have lost kidney function, people have had heart attacks. These drugs, can you imagine, the effects on a young person's brain? We know that cannabis used at a young age can really affect the actual way the brain develops and these compounds are up to 100 times as potent as cannabis. REHMAll right. Let's hear from someone who experimented. Nora, you're in Silver Spring, Maryland. Go right ahead. NORAYeah, about five years ago, I was in my late 20s, and considered myself successful. Had a master's degree and a full time job, but I was a smoker at the time, cigarette smoker, and I ran into a friend outside a bar who offered me a toke of spice. And I was fascinated and bit And wound up in the hospital that night with hallucinations. It was one of the worst experiences I've ever had and I would just warn that otherwise rational people can succumb to this sometimes. But that it is highly dangerous. NORAAnd that the promise and allure of a legal alternative to marijuana, which I guess is now actually legal in D.C., is not worth it. REHMThanks for calling, Nora, and sharing your own experience. Dr. Kelen, she talked about hallucinations. I gather that is just one of the milder outcomes of these synthetic drugs. KELENThank you, Diane. As I pointed out, you know, we see a filtered version. I'm sure some people get the effect that they had hoped. But we see the very dramatic, life altering problems that people can have. And I mentioned that even young children, in their very early teens, can have evidence of heart attacks and strokes from taking what, to them, seems like initially a lot of fun, probably related to the price and peer group pressure. I'm hoping that this show does prevent, or at least wakes up some parents and teachers and so forth to help further educate. KELENBecause this is predominantly marketed to young people, and even in the emergency department, we're seeing people from about age of 12 into their mid-20s. So, this is a relatively young person's use, although people up to the age of 60 have been clocked using this. REHMAre you really telling me that people as young as 12, Dr. Kelen, are using these drugs? KELENThere have been several studies that have looked at patients coming into emergency departments and yes, as young as 12 and I think as old as 67. Three quarters of them tend to be males, but the peak age, actually, is 12 to 17. ARTIGIANIYes, it is true. It does cover a wide age range of users. And so, there's a national survey, for instance, monitoring the future survey that's been done since the 1970s that found, in 2012, that about one in nine 12th graders, or high school seniors, had used synthetic cannabinoids in the past year. Now fortunately, that percent has come down to about six percent in 2014. But there still is the need to have programs like this and have forums for getting accurate information out. Because only about one in three of the students even in 2014 perceived a great risk of harm from these drugs. REHMI see. All right, let's go to Ryan in St. Louis, Missouri. You're on the air. Go right ahead. RYANHi Diane. Thank you. Freshman year of college for me, Kansas City, in 2009, 2010, I was with a group of friends, probably about 15 different people that I used to smoke synthetic, you know, K2, Spice, whatever you wanted to call it. There's, you know, dozens and dozens of different brands. You know, people from China, predominantly, just spray whatever chemical onto just different herbs. And it's very easy to get your hands on, and it's very easy to abuse. I was lucky enough to stop smoking it, but I know several of my friends who I definitely wonder if they had, you know, long term, permanent effects. RYANBecause you can go, for 90 dollars, I saw someone go in and buy, you know, something that they resold for over 350. And it's very much successful, and at the time, we justified it saying that it's legal. We can't get in trouble for this. So, that's all. REHMTell me, tell me Ryan, why you decided to stop using. RYANFor me personally, I had a bad experience. I vaporized it and I got way too high. I couldn't fall asleep. It was excruciating. And it was awful experience. And it doesn't compare at all to natural marijuana. It is very dangerous. It's not controlled or regulated and it's a very scary thing. REHMWell, I'm glad you called and I hope that sharing your experience is going to help others who might be tempted. And you're listening to "The Diane Rehm Show." Marilyn, you wanted to add something. HUESTISYes, I think one thing that the public needs to know is that the chemists are continually trying to change these compounds, because we, the DEA, has laws and they list specific compounds that are illegal. And they say, anything that is similar is illegal. It's called the analogue law. The problem is the chemists are trying to make them so different that they wouldn't qualify as analogues and might be legal. And this is one of the biggest problems is how rapidly this is moving. HUESTISAnd the truth is, unless you know the pharmacology of the drug, how the drug affects the body, and how the body metabolizes the drug, you can't say that it's illegal. If you can't show that it is. So, many of the judges and the prosecutors and the police are saying, we need that human pharmacology to prove the drug is illegal. REHMI gather, Marilyn, you became involved in this whole issue because the military came to you. HUESTISAbsolutely. So, I'm very active internationally, and saw the problems, because the problems first surfaced in Europe and in Japan and then came, later, to the US. So, I was very concerned and worried about these new drugs. And the military was worried, too. We have military personnel stationed all over the world. They were very concerned, and as you know, in the military, they have a very strict drug testing program that makes sure that military personnel are not using drugs. HUESTISSo, they were concerned. And I will tell you, after much work and effort, we found over 1.4 percent of military worldwide had some synthetic cannabinoids. When you consider that all other drugs together, cocaine, cannabis, whatever, is less than one percent, this shows you the seriousness of that issue. ARTIGIANISo, I can't underscore that enough, what you've been saying all along, Marilyn. And just to let your listeners know, Diane, if they're interested in finding more information about synthetic cannabinoids or other synthetic drugs that we've talked about today, they can find that information, of course on the NIDA site where they have drug fact sheets on a number of different drugs. But also on our website, www.caesar.umd.edu. Where we've pulled together a whole packet of information on synthetic cannabinoids. ARTIGIANIAnd our new website, the (word? ).org website, where we have information about Flakka, which is the synthetic stimulant that was mentioned earlier. REHMAnd one last question. How addictive are these drugs? HUESTISThey're very addictive. So, cannabis is addictive too. People can become dependent on cannabis. And now, you consider that these are 100 times, up to 100 times as potent. So, (unintelligible) they have police and others become very aware. We have lots of drug driving issues with people using these drugs. And many become dependent and have a tremendous difficulty getting off of it. The withdrawal is quite, quite impressive. REHMIt would seem to me you're going to have to go into the schools to talk about the hazards of these drugs, because certainly, from what Dr. Kelen has said, a young person is going to be that much more susceptible and that much more potentially harmed by the use of these drugs. Well, very informative program. Thank you all so much. Erin Artigiani of the Center for Substance Abuse Research at the University of Maryland. Marilyn Huestis of the National Institute On Drug Abuse at NIH. And Dr. Gabe Kelen, he's Emergency Physician in Chief at Johns Hopkins University Hospital. Thank you all so much. KELENThank you for having us, Diane. REHMThanks for joining us. I'm Diane Rehm.